From the whimsical, pastel-colored tenements of Zamosc, Poland to India’s “blue city,” these gorgeous colorful cities require no filter. 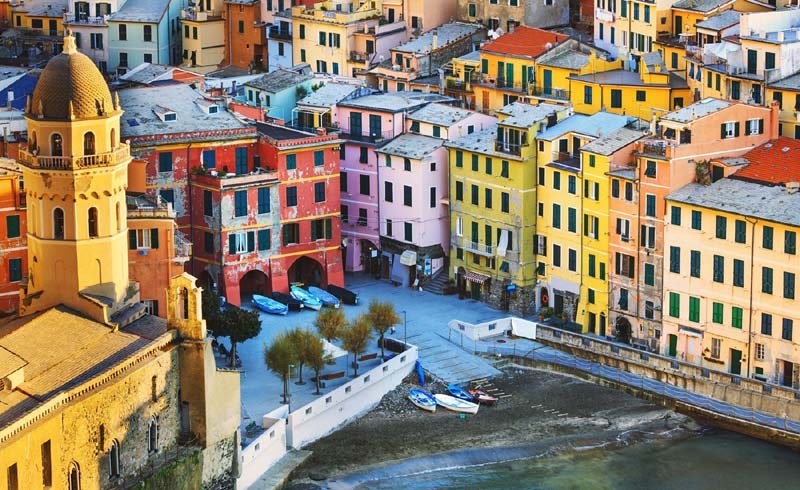 Cinque Terre, or “Five Lands,” is the name given to not one but five stunning villages perched along the Italian Riviera. 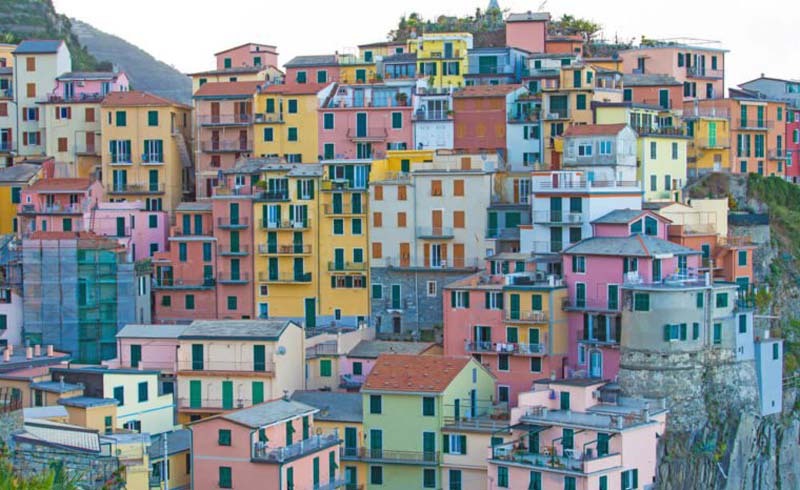 Each village has its own character, but they all boast an incredible array of pastel-colored houses. Cinque Terre is situated inside a national park near Tuscany, so cars are a rare sight! Most of the 2.4 million tourists who visit per year arrive by boat. Once they get there, they mainly walk, taking in the sights of the Riviera along the seven-and-a-half-mile hiking trail. 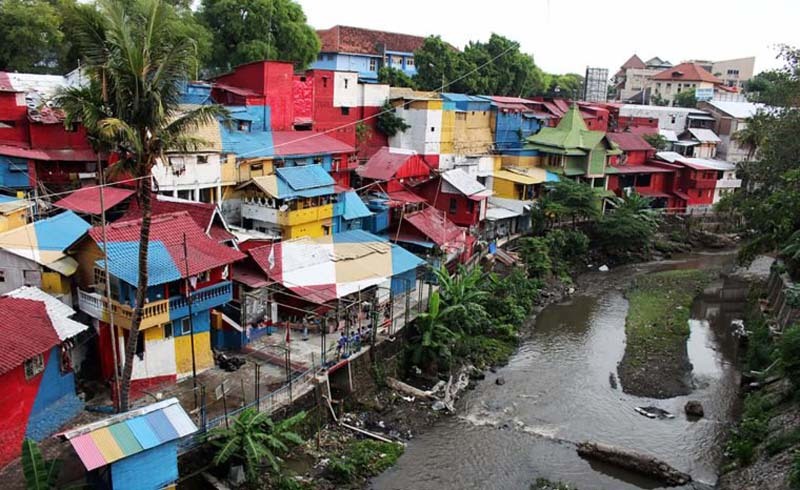 In Kampung Pelangi, it’s not just the houses that are rainbow-colored. Everything from the awnings to the fences in this village is bedecked with rainbow hues. In mid-2017, the town underwent a major makeover in hopes of drawing more tourists. According to Architectural Digest, every house in the village was required to have no fewer than three colors represented. The endeavor has paid off: tourists have been flocking to the village, and the town hopes to extend the color flood to even more houses in the coming months. 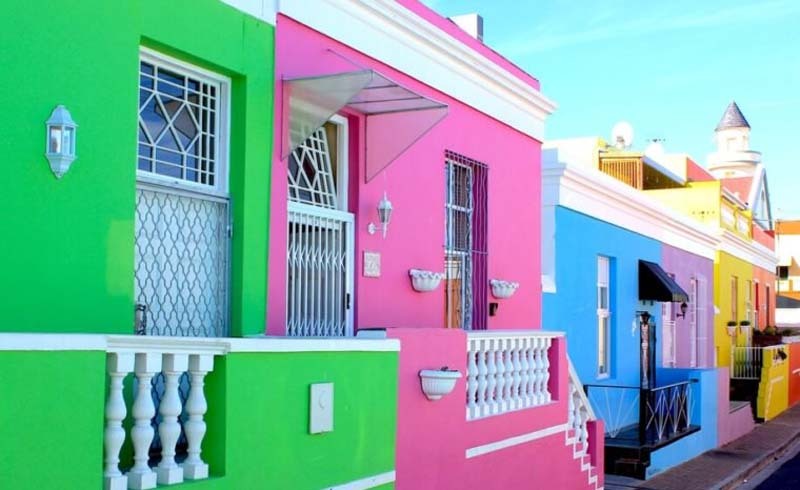 Cape Town’s most colorful neighborhood is also one of its oldest, dating back to the 16th century. The primarily Muslim population recently began embellishing their houses as a celebration of the late summer holiday Eid al-Adha, the Feast of Sacrifice. The bright colors also symbolize the freedom of the post-Apartheid era in South Africa. The oldest still-intact house in the area, built in 1768, is now a museum celebrating the Islamic culture of the region. 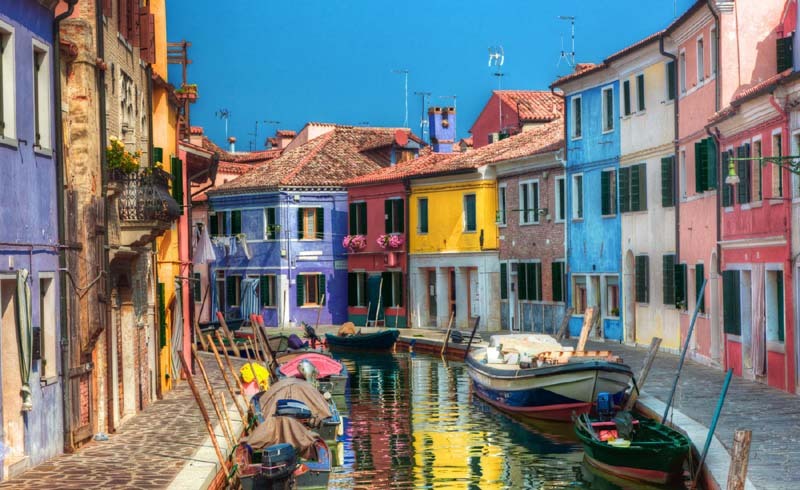 You might be seeing double on this spectacular island in the Venetian Lagoon, as the multicolored houses are reflected in the canals below. 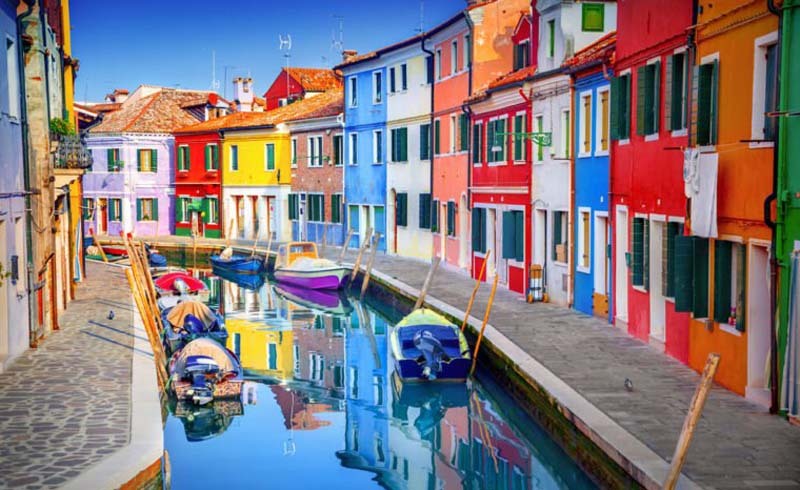 Burano is a fishing village, and legend has it that the residents painted their houses vibrant colors to help them find their way back from a night of fishing in the early-morning fog. The colors of the houses may appear random, but there is a method to the madness. If you move to this island, you can’t just pick your favorite paint color and go to town—you have to get permission from the government, and they choose a color for you. The whimsical look of the village might be carefully planned out, but that doesn’t take away from the city’s beauty. In this Ecuadorian city, the village of Las Peñas immediately stands out. It rises on the massive limestone hill that marks the city, above a white church that provides a stark and beautiful contrast to the vibrant houses. 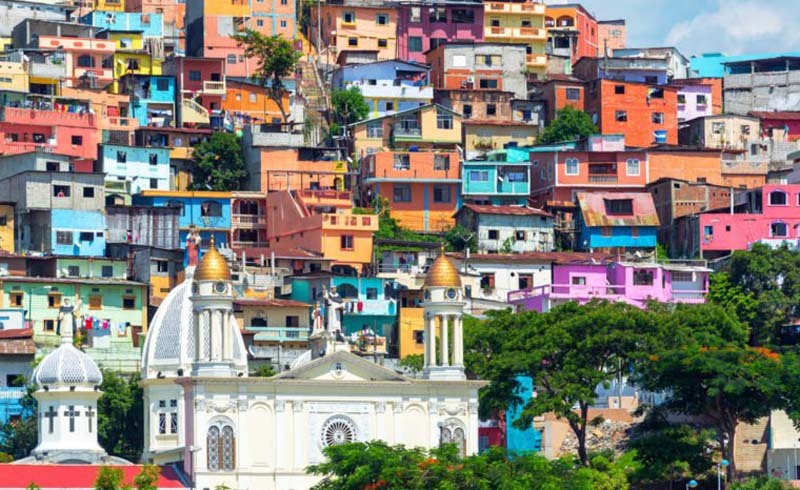 In addition to being the most colorful neighborhood in Guayaquil, Las Peñas is also the oldest. It’s endured its share of difficulty, including a catastrophic fire in 1896, but it’s come out stronger. In 1982 it became an Ecuadorian heritage site. Throughout the years, it’s been a haven for writers and creators, including Ernest Hemingway and the composer of the Ecuadorian National Anthem. A long time ago, when India adhered to a strict caste system, blue was a major status symbol, with the upper class painting their homes the “royal” color. Though caste restrictions have loosened significantly, the color has stood the test of time, and blue houses remain popular in India simply as a matter of tradition. 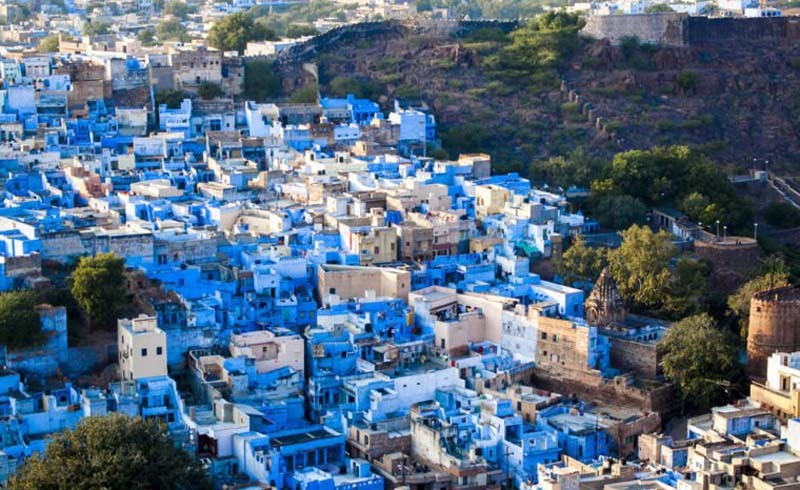 And nowhere is this more apparent than in the “Blue City” of Jodhpur. The bustling capital of this popular Caribbean destination is packed with casinos, restaurants, and wonderfully decorative, colorful buildings. 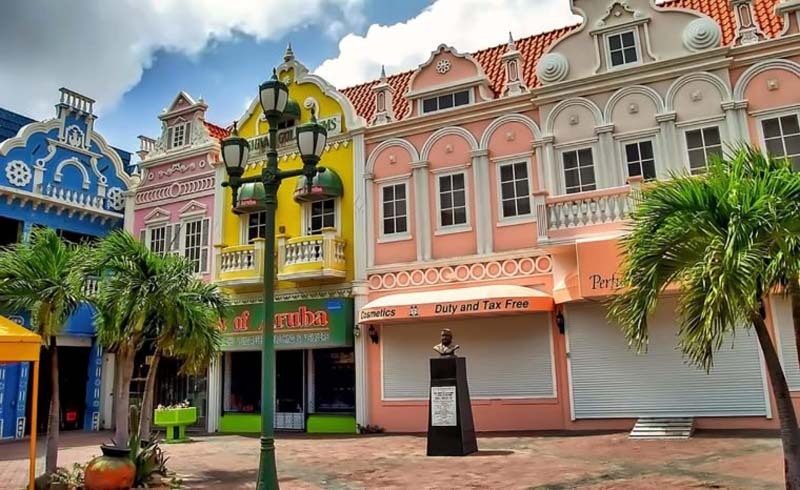 The cheery city center fits with Aruba’s oft-marketed slogan “One Happy Island.” Since Aruba is a Dutch territory, the architecture mimics a classic Dutch style while putting its own Aruban, pastel-colored spin on it. 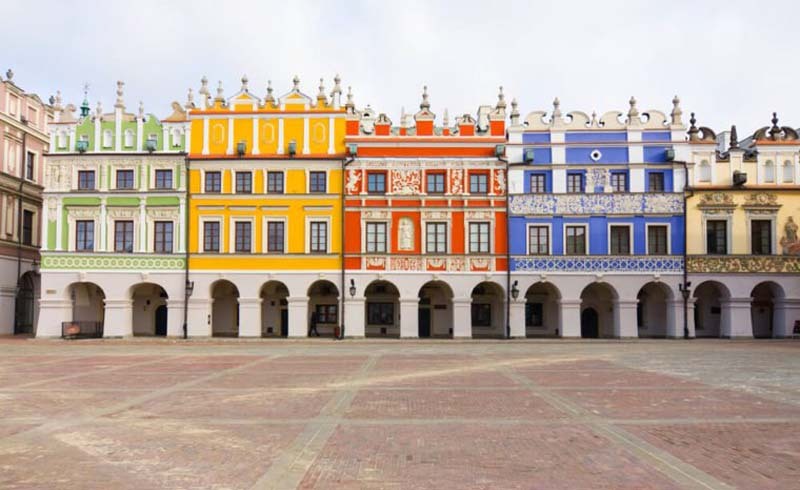 These delightful, turreted buildings line the city square in this small Polish town. With their intricate white designs, different on every house, and their arched entranceways, these tenement houses look like something out of a fairy tale. Zamosc sits near the Ukrainian border, and its well-preserved “old neighborhood” has earned it the title of UNESCO World Heritage Site. 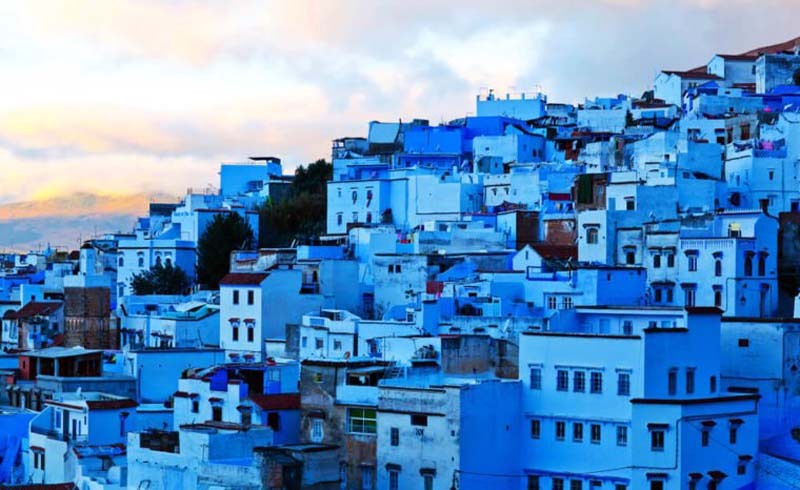 This stunning city of cobalt sits among the Rif mountains in northern Morocco. Established as a fort to keep invaders out, today Chefchaouen draws tourists in with its color scheme like no other. Aside from just being pretty and eye-catching, the color blue also has its share of practical purposes: many people believe that chemicals in blue paint deter hungry termites. Still, others maintain that the cool color helps keeps the temperature in the homes from getting too hot, especially in warm climates like Morocco’s and India’s. Whatever the reason, these all-blue cities sure are gorgeous. 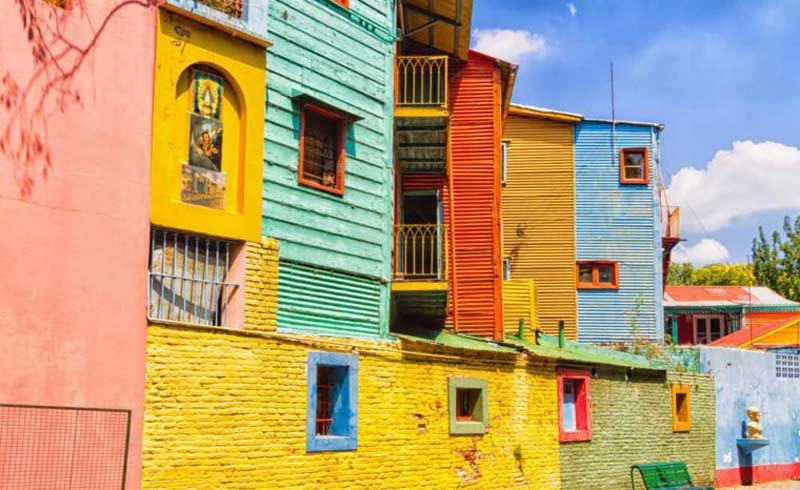 What started as a working-class neighborhood hidden in Argentina’s capital has become a vibrant tourist attraction known the world over. The best-known street, Caminito, was built from scrap wood from the local shipyard. The story goes that people just painted the houses with the available paint left over in the shipyard. What started as a haphazard mix of colors has turned into a gorgeous, lively hub of activity. 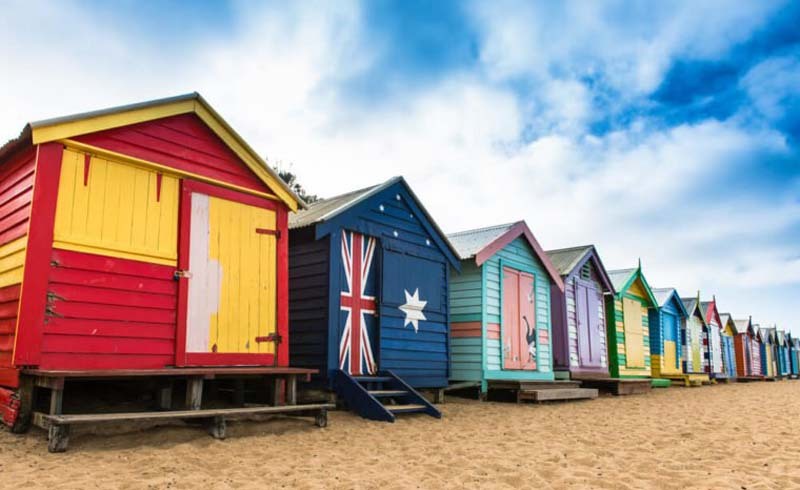 It’s common knowledge that Australia is chock-full of beautiful beaches, but Brighton Beach in Melbourne might be the most unique of them all. It’s not the natural features that send tourists flocking to this beach—it’s the row of over 80 bathing boxes, each adorned with its own color and pattern. The boxes have been around since the early 1900s—almost as long as Australia has been called Australia. The city council fought to have them taken down, but today, Melbournians and tourists alike wouldn’t be able to imagine Brighton Beach without them.